Because our group couldn't obtain an entry permit, we decided to bird some of the key bird sites around Alice Springs. 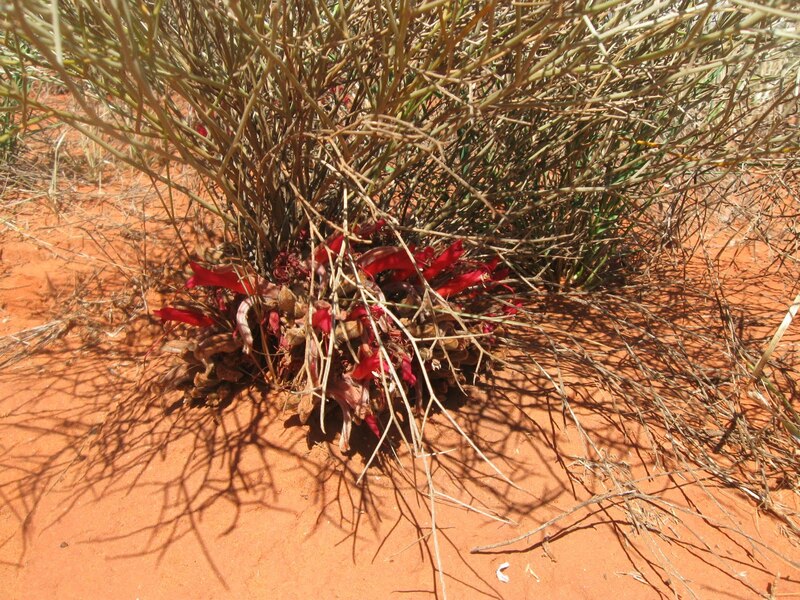 Paul and Ruth had not birded the Red Centre before, so there was much to be seen. We also thought we'd drive the Mereenie Loop Track (a road that requires a transit permit, obtained from Kings Canyon or Glen Helen), and then bird in Watarrka National Park. There was a recent report of someone photographing some Princess Parrots in Watarrka - so we were hopeful of finding suitable habitat. 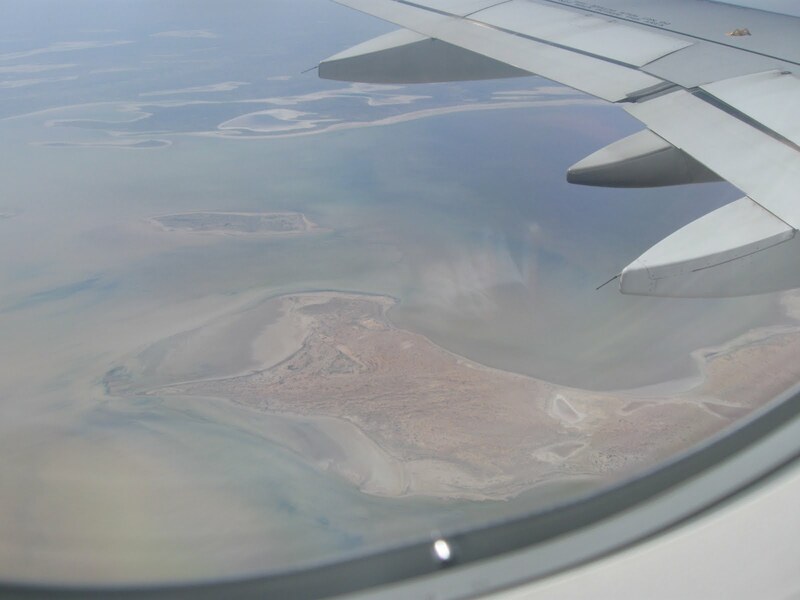 From 39,000 ft - almost full Lake Eyre on the flight to Alice Springs. For the record, I flew to Alice Springs from Melbourne on Tiger Airlines. They are offering extremely cheap flights - the ticket from Melbourne to Alice cost $85! (The return flight was $160.) Beware though, my excess baggage cost $170 (and then $70 on the way back, after tossing half my stuff). I literally could have bought all my logistical provisions in Alice Spring for less! So if you do travel via Tiger make sure you upgrade your luggage allowance; it would have only cost me only $20. Before talking about the birds it's worth mentioning the plant life that was dominating the region. 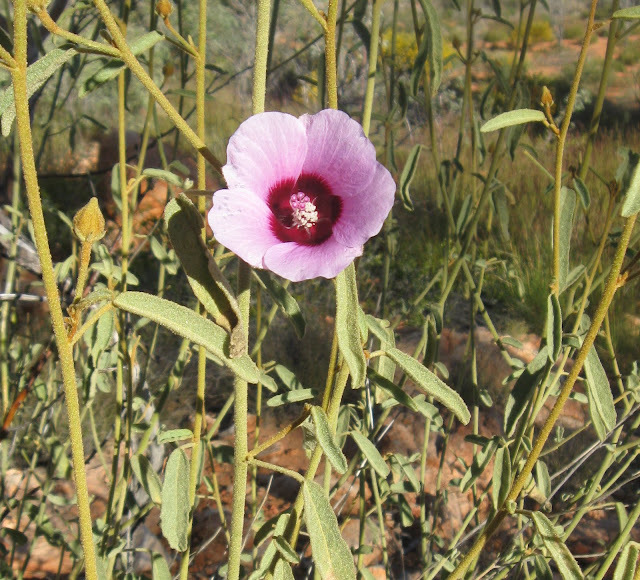 There are a number of very distinct environmental communities in the Centre; these includes sand dunes scattered with the graceful and long-lived drooping Desert Oak (Allocasuarina decaisneana) and Spinifex on the top (providing a stable micro-environment), riverbeds lined with River Red Gums, sand-plain open woodlands, tickets of mulga and shrublands, and sparsely vegetated rocky ridges, ranges and outcrops, sometimes with wet gullies. From my experience, when birding in the Centre it's important spend time in each of these different habitat in order to see all those special birds for the regions. Umbrella Bush (Acacia ligulata) - Watarrka is the Luritja name for this plant -, the spectacular Flame (or Honey) Grevillea (Grevillea eriostachya) and Honeysuckle Grevillea (Grevillea Juncifolia), both dripping with nectar, Holly (or Wickham's) Grevillea (Grevillea wickhamii), Cassia (Senna Artemisioides), Desert Hop-bush (Dodonaea viscosa) and there three kinds of Spinifex, known by local Aboriginal communities as Tjanpi - Soft Spinifex (Triodia pungens), Hard Spinifex (T. basdowii, which grows out from the centre of the clump, forming 'fairy rings') and Feathertop Spinifex (Plectrachne schinzii). On this trip - in chronological order - I birded Kunoth Bore (mulga), Trephina Gorge (a rocky Gorge outcrops), the Fink River (a river), Mereenie Loop Road (sand-plains and open woodlands), stopped at Jump-up Lookout, Tnorala (Gosse Bluff) Conservation Reserve, Watarrka National Park (with gorges with rockholes), walking the Kathleen Springs and Kings Creek Walks, birded along the Desert Oak lined Luritja Rd, then back to the Ormiston Gorge turnoff, back east to Santa Teresa Road, and finally the Alice Springs Treatment Plant. 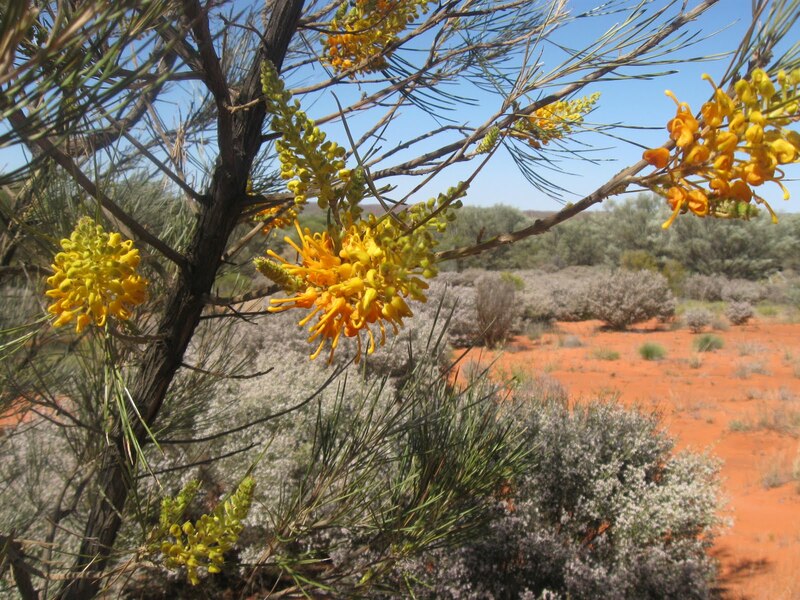 In the end I saw 132 species for this trip to the Red Centre. Little Button-quail was more common than I've witnessed anywhere before - again we were literally kicking them out of the way (not literally). I'd estimate we flushed over 100 birds. 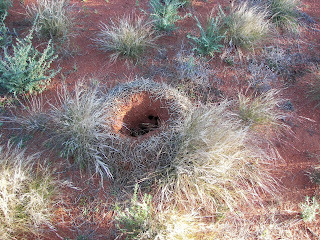 Another feature of the mulga near Kunoth Bore was the architecture of the nests of the Mulga Ant (Polyrhachis macropa), a large solid soil ring covered in mulga phyllodes. 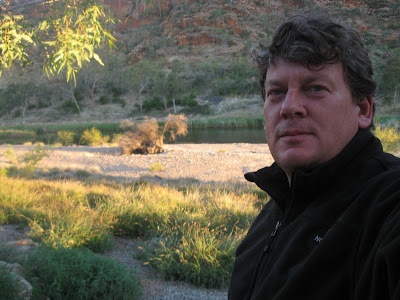 At dusk we staked out Kunoth Bore itself, hoping to see Bourke's Parrot. There were few waterbirds on the bore, and no land species were coming in to drink. By contrast the last time I was at Kunoth Bore there was nearly a hundred Common Bronzewing, amongst others. This time they were absent. The reason was obvious - there'd been so much rain in the areas that there was no need to drink at the bore. Bourke's Parrot, for instance, normally arrive immediately after dusk - this time they didn't arrive. We did here them though, roosting in the trees nearby. We did the Trephina Gorge Walk, coming across a pair of Dusky Grasswren at the highest point of the walk. We also quickly caught up with Grey-headed Honeyeater - these two species were new birds for Paul and Ruth, so not surprisingly they were very pleased with themselves. On the walk back along the gorge it was a real treat to hear the call of a Grey Shrike-thrush (the more rufous race rufiventris) echoing between the walls of the Canyon. Other birds here include Budgerigar, Crimson Chat, Diamond Dove, Little Woodswallow, Zebra Finch and calling Western Gerygone. On my last trip here I'd seen Rufous-crowned Emu-wren at this site; however they evaded us this time round. A number of others had also reported that they'd not seen them at this site. We weren't particularly perturbed, and we didn't really search that hard (as hard as it takes to find a Rufous-crowned Emu-wren) - we'd planned to catch up with this species later in the trip at Santa Teresa Rd. At the turn-off we also saw Brown, Grey-headed and White-plumed Honeyeater, Little Woodswallow, Fairy Martin and Australian Ringneck. Nearby, along the Ormiston Gorge Access Rd (about a kilometre from the turn-off), a pair of Spinifex Pigeon (the white-bellied race leucogaster) flushed from the roadside to small rocky outcrop. This was the first for the trip and a new species for Ruth and Paul, giving us excellent views. Like the camping ground at Trephina Gorge, the Ormiston Gorge camping site was full, so we headed to the nearby Finke Two Mile Bushcamping Area (you can camp up to 2 km south and downstream of the Trail-head), a fortuitous move, as it proved to be a wonderful camping area overlooking the Fink River. 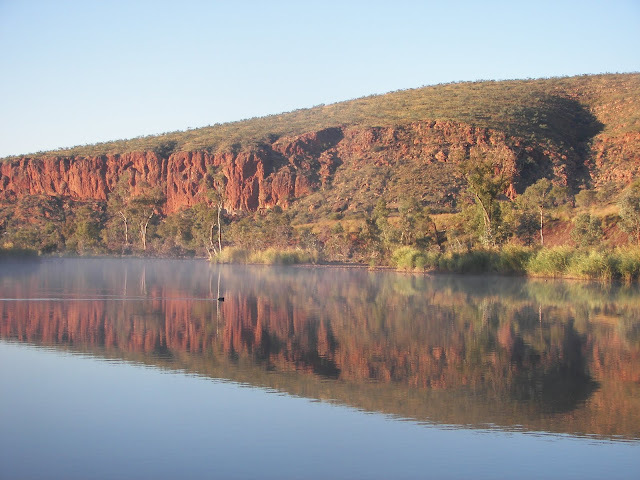 The Fink River (sometimes sited as the oldest river in the world), is usually a string of waterholes; however it was now almost fully flowing. The campsite is accessed by a sandy track on the north side of the hwy - the turn-off is not signposted but is to the north of Namatjira Dr just past Glen Helen Resort - upstream from the Finke River crossing on Namatjira Dr. You will need a 4WD to get to it and there are no facilities, but the feel of the place is hard to beat, and we camped there 2 nights. Here we picked up some waterbirds including White-faced and White-necked Heron, Great Egret, Great Cormorant, Australian Grebe, Black-tailed Native-hen, Purple Swamphen, Coot, and at night heard a flock of Plumed Whistling-Duck. Other birds here included Black-fronted Dotterel, Little Grassbird, Australian Reed-Warbler, a nice flock of Red-tailed Black-Cockatoo, Cockatiel, Whistling Kite, Pallid Cuckoo, Rufous Songlark (fast becoming the bird of the trip - we were hearing them at every stop we made), Striated Pardalote (yellow-rumped black-headed race uropygialis), Pied Butcherbird and Mistletoebird. During a clear sparkling night, the Milky Way showed its full band of the starry lights. It's been calculated that you can see 3000 separate stars with the naked eye - and I think that night we could see them all. 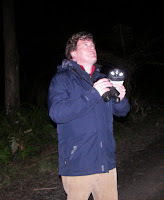 Also during the night distant Dingoes howled. When I awoke I found a footprint immediately outside my tents entrance! 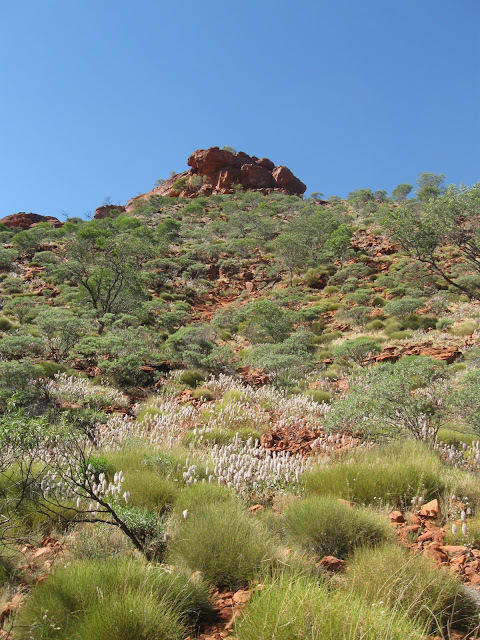 Tnorala (Gosse Bluff), west of Alice Springs, is the remnant of a huge crater left by a comet 130 million years ago. 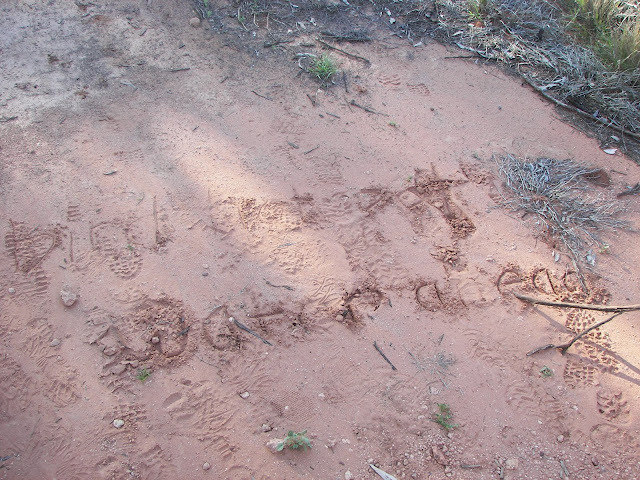 There is a Western Bowerbird bower near the first picnic table, and on the walking track from the carpark we saw Red-browed Pardalote, Black Honeyeater, Red-capped Robin and Splendid Fairy-wren - with the males looking resplendent in full-breeding plumage Also along here we found a note drawn into the sand stating "Bird hotspot: Water ahead". There is a possibility that this was drawn by friends of mine, Fiona Parkin and Jon Thornton, who'd visited the site several days earlier. They'd actually flown out of Alice Springs an hour before I flew in - I must ask them. A message in the sand: "Bird hotspot - Water ahead". From the top of the lookout we were able see Red-browed Pardalote, Grey-headed Honeyeater, Dusky Grasswren, Tree Martin, Little Woodswallow and a pair of very grey looking Brown Goshawk circled the pound - the northern form is much paler than southern Goshawk. 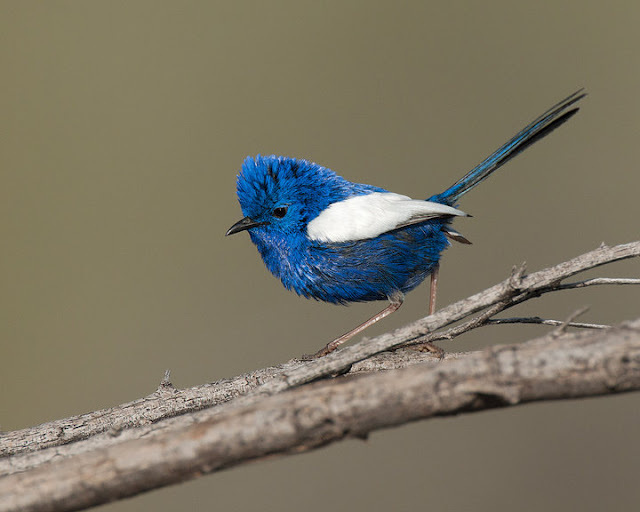 Other birds here include Little Button-quail, Fairy Martin, Crested Bellbird, the turquoise Splendid Fairy-wren, again in full breeding plumage. Also here a young Military Dragon (Ctenophorus isolepis) was seen basking in the sun on Spinifex. Despite not being able to access the area where the Princess Parrot had been seen, we'd calculated that if we drove the Mereenie Loop (Larapinta Drive), we'd at least be within the range of where the birds might be. A number of people had said that there was appropriate habitat along the road. 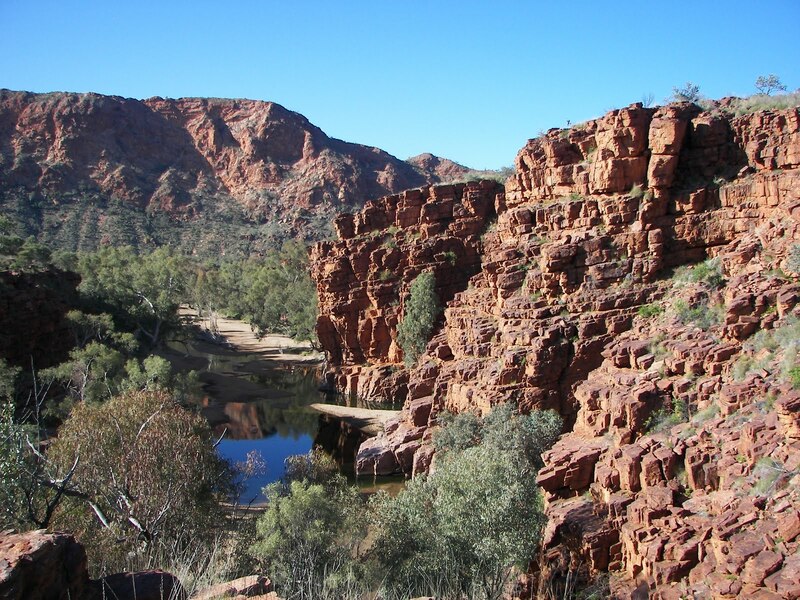 A distance of about 290 km it follows the George Hill Range and the Gardiner Range to the west side of Watarrka National Park. 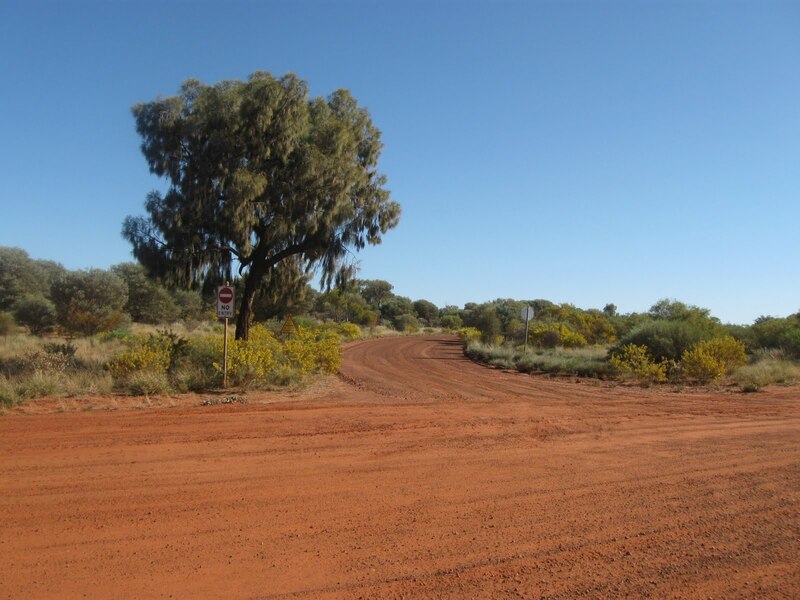 The road passes through Aboriginal land, so a pass is required. It is available from the Alice Springs Tourist Information Centre, Glen Helen Resort and Kings Canyon Resort for about five dollars. It's a good quality unsealed road, but is corrugated, and has some bad ruts (waterlines across the road), so I'd advise driving it with a 4WD. 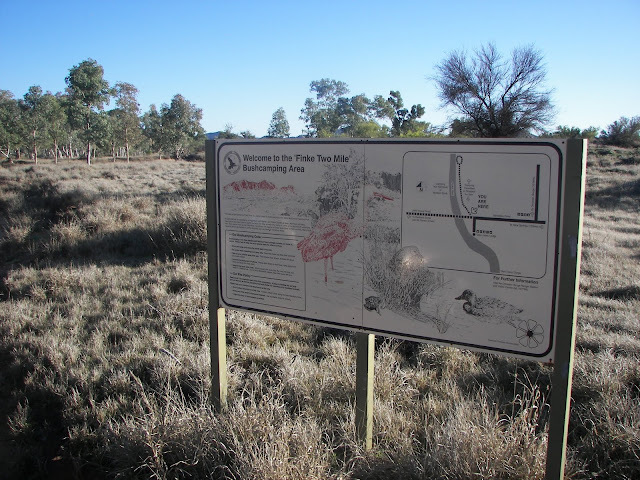 It passes through some beautiful scenery and rocky ranges, with woodland dominated by Desert Oak and Desert Kurrajong, with a scattering of small termite mounds. Although strictly speaking you weren't meant to stop on the Mereenie Loop Track we did park a couple of times (toilet breaks) beside the road to have quick look at some nice looking sand dunes covered in Desert Oak. 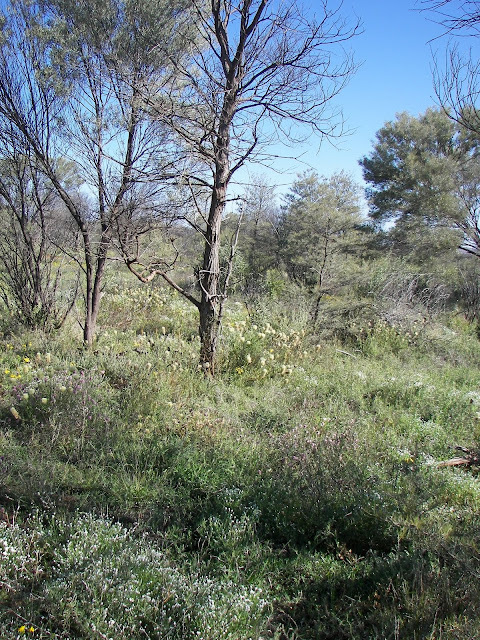 These dunes were superb habitats for wildlife, with plants such as Upside-down Plant, Flame Grevillea, and Eremophila all flowering. Unfortunately there were no Princess Parrot. We did however see honeyeaters such as Spiny-cheeked, Pied, Black and Grey-fronted, Crimson Chat, Western Gerygone, Crested Bellbird, Mulga Parrot, Australian Ringneck, our only Major Mitchell's Cockatoo (pink-crested race mollis), White-backed Swallow, large flocks of Zebra Finch and Diamond Dove feeding on seeds, and Black-faced and Masked Woodswallow hawked for insects. 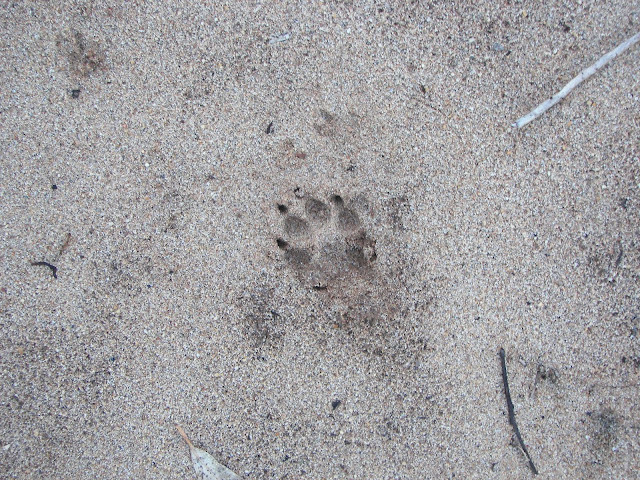 We also saw feral species mammals such as Camel, Horse, Donkey as well as a few Dingoes. As we passed a couple of tracks that turned west in to the lands that the parrots had been seen we lamented what might have been. As it was, these tracks were in an area that was still very wet, and it would have been impossible to drive them - indeed only a couple of days earlier the Mereenie Loop Track was closed due to rain and flood. We camped at Kings Canyons Resort - not a bad place, bit touristy, although the food at the resort was dreadful and expensive. But at least you could have a nice cold beer in the bar. In the morning we were serenaded by Pied Butcherbird - the last three notes of its call sounding exactly like the last three notes of the ABC theme music (da-na-naa). While there we did a couple of walks along the parks spectacular gorges; the Kathleen Springs Walk and the Kings Creek Walk. 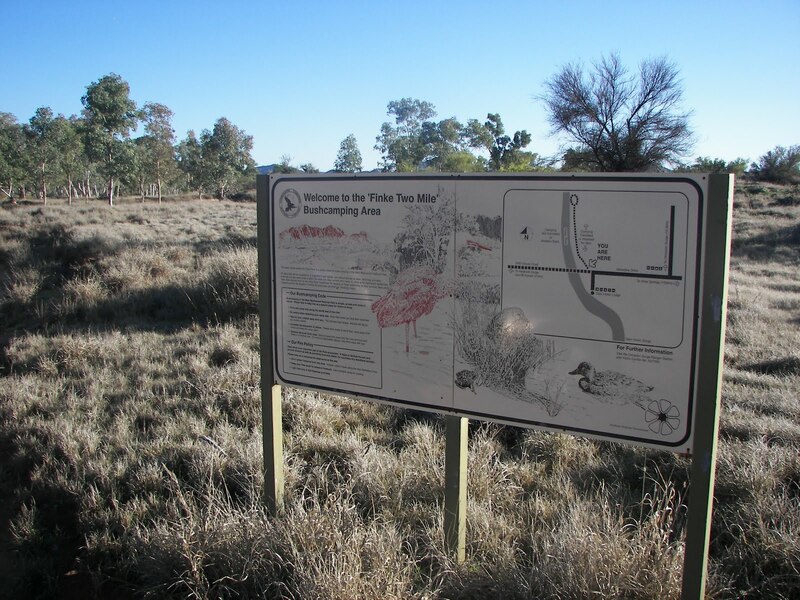 The gullies on both walks were microclimates, supporting a range of birds and plants, including remnant species such as the Finke River Palm. Spinifex Pigeon (the white-fronted race leucogaster) was common along both walks, often, as if by magic, appearing at your feet when you stopped. There are a lost smaller that you think, almost half the size of a Crested Pigeon, which was also common. Red-browed Pardalote (in the upper foliage), Grey-headed, Brown and White-naped Honeyeater foraged for food in the River Red Gum, while Zebra Finch and Painted Finch (surprisingly common) regularly dropped into drink at the waterholes. 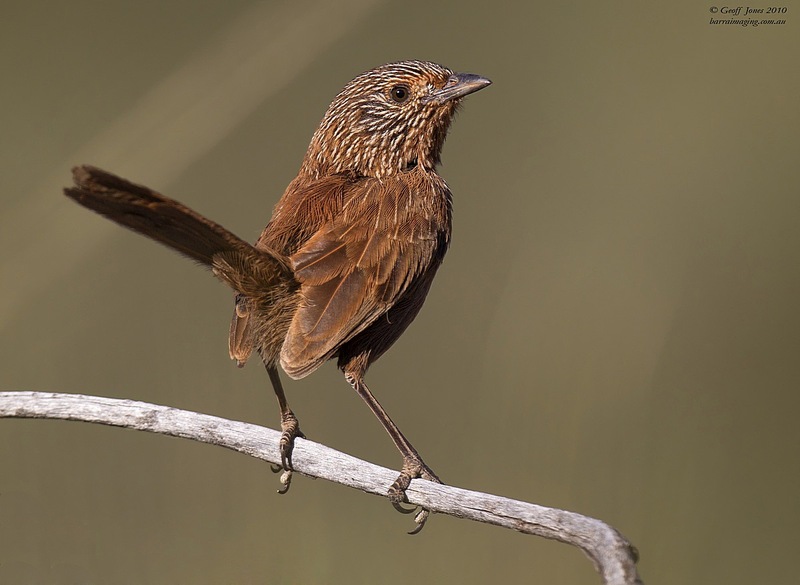 Dusky Grasswren was also seen at the start of the Kings Creek Walk - and they were surprisingly tam, with a pair bouncing around the path near the first creek crossing. Western Bowerbird was seen and heard, often in association with Desert (or Rock) Fig (Ficus platypoda), calling like a cat with the flu. 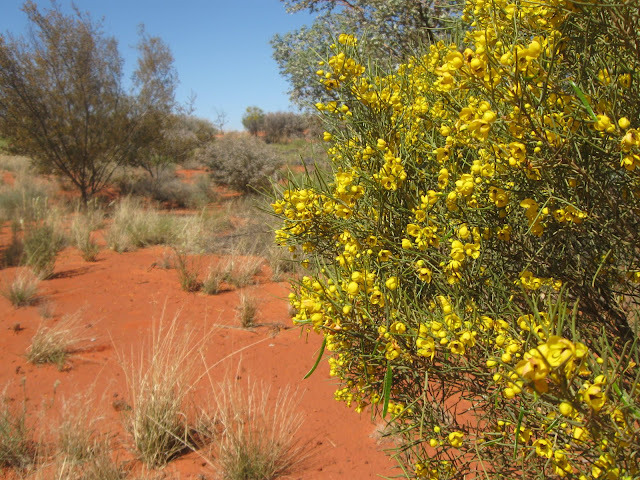 We also drove up and down Luritja Drive within Watarrka National Park - a road lined with Desert Oak. Birds included Mulga Parrot and Australian Ringneck, and a few raptors, such as Spotted Harrier and approachable Brown Falcon. After Kings Canyon we headed back along the Mereenie Loop, camped once again on the Finke River, and then headed to Santa Teresa Rd, south of the Alice Springs airport. 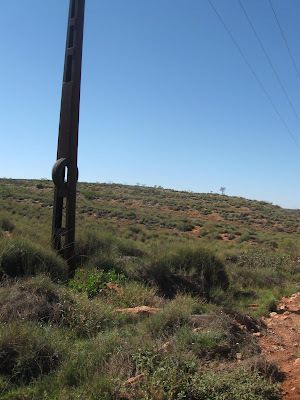 Marked by a tyre in a telegraph pole 32 km from the Alice Springs Airport, there is a series of stony slopes. 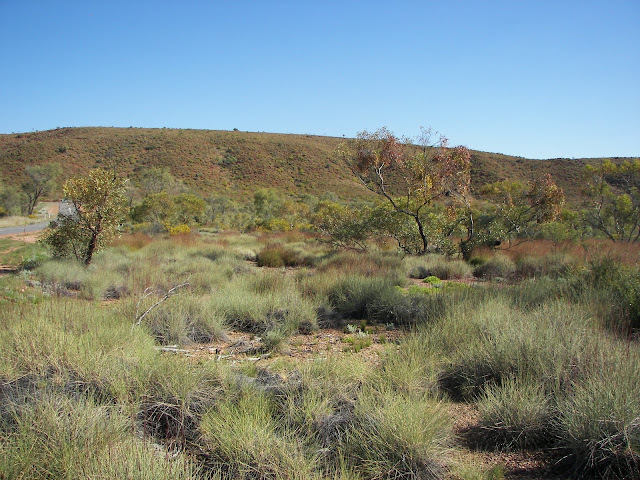 It is a recently popularized site for seeing spinifex specialist bird species such Rufous-crowned Emu-wren, Dusky Grasswren and Spinifexbird. The best place to look is the spinifex just east of a tyre wedged in a telegraph pole. Here we found Rufous-crowned Emu-wren in the small valley between a ridge line about 100 metres from the road. 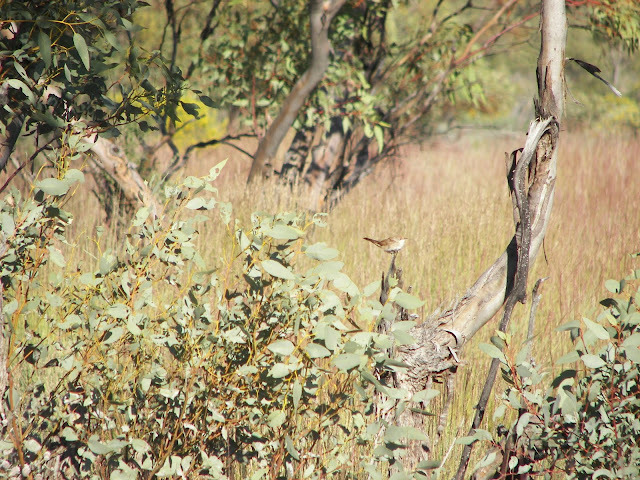 On a ridge a further 50 metres north we found Dusky Grasswren. We also saw our second group of Grey-fronted Honeyeater for the trip, and perhaps surprisingly a small flock of Painted Finch. Other birds included Budgerigar, Pallid Cuckoo, Rufous Songlark, and Crested Bellbird - and on the drive back in to Alice, Swamp Harrier, Black-faced Cuckoo-shrike, Masked, White-browed and Black-faced Woodswallow . The final site for my trip was the Alice Springs Waster Treatment Plant - perhaps one of the best contained wetland areas in Australia. It is superb place to bird-watch, being an important refuge for inland waterbirds and stopping point for migratory waders. It's located on Commonage Rd, just south of Heavitree Gap. There is a birder access gate - however you need to get a key from Power and Water in the Alice Springs Plaza in Todd Mall. 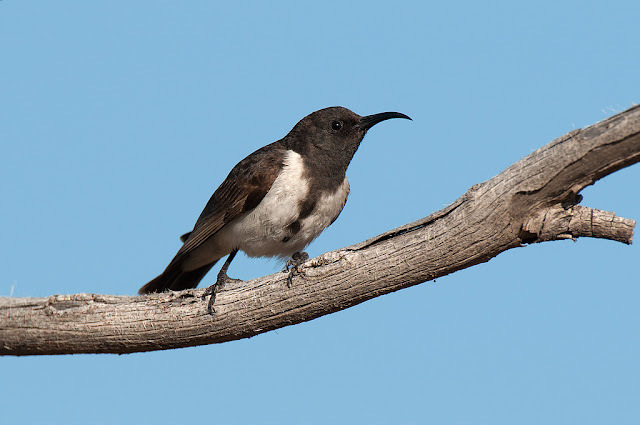 Although it was relatively quiet, in terms of the variety of bird species - presumably due to the abundance of water throughout central Australia - there was still some excellent birds to be seen. We walk around most of the ponds, with the highlights being Glossy Ibis, Pink-eared Duck, Hardhead, Yellow-billed and Royal Spoonbill, Black-tailed Native-hen, Red-kneed Dotterel, nice flocks of Black-winged Stilt and Red-necked Avocet, Common, Wood, Marsh and Sharp-tailed Sandpiper, Common Greenshank, Black-tailed Godwit, Whiskered Tern, Little Crow, Tree Martin, Australian Reed-Warbler and Little Grassbird, and in the shrubland areas in the south-east, full of water,Variegated and cobalt-blue White-winged Fairy-wren. I stayed the final night of the trip in downtown Alice Springs. 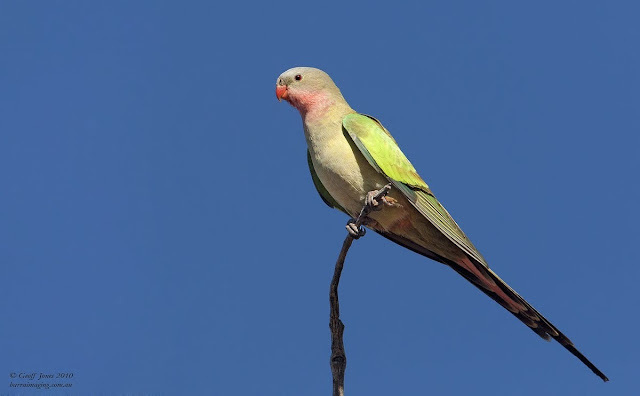 The most common bird 'on the street' was Australian Ringneck - the yellow-bellied black-headed Port Lincoln race zonaruis, a pleasant surprise - it seemed to play the role that a Rosella might play in south-eastern cities. Another common town birds was White-plumed Honeyeater, race leilavalensis, a bird that's much more yellow than the south-eastern birds. Galah, Willie Wagtail, Pied Butcherbird and Yellow-throated Miner were also birds about town, as was Spotted Turtle-Dove, the only introduced species I saw for the whole trip. I also heard a Pied Currawong (while drinking a beer) in the restaurant courtyard the hotel, which seemed immediately odd, considering the nearest population was well over a thousand miles away. It turned out to be a recording, played over the hotels internal speakers; they were randomly playing Australiana music CDs (mostly new age elevator music, the sort of stuff you buy in an airport newsagent) and they'd reach a CD called 'Australian Birds Calls'. The recent rains in the Centre have created perfect conditions for birding. When I was there the days where fine and sunny (my last day in Alice it was 33 degrees). However just before I arrived there were some seriously heavy rains, with much of the Centre swamped and most of the bush tracks impassable. Interestingly the day I left it started to rain again - and I've just heard that Paul and Ruth ended up getting stuck for four days, and had to camp out, after their car was caught up in an overflowing river near Hermannsburg! What a brilliant trip, great birding and spectacular landscapes, excellent company, and due of the rains the plant life was at its complete best. Flowering Eremophila, Grevillea, Thryptomene, Cassia, Spinifex, Allocasuarina, Accacia, Leptosema (the wonderful Upside-down Plant) and Eucalyptus says it all. 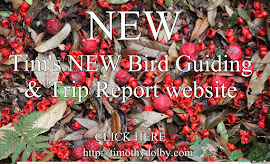 Not mentioned the birds - there was a feast of wrens, such as Dusky Grasswren, Rufous Emu-wren, and full breeding plumage Variegated, White-winged and Splendid Fair-wren. Could it get any better!